Brown meat in large nonstick skillet on medium-high heat; drain. Add next 8 ingredients; cook 5 min. or until onions are crisp-tender, stirring frequently. Stir in pasta sauce; cook 2 min. or until heated through, stirring frequently. Remove from heat; stir in 1/2 cup cheese. 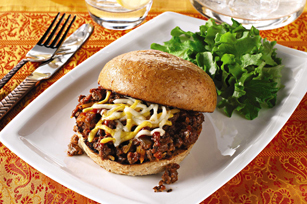 Fill buns with meat mixture and remaining cheese. Substitute using your favourite Kraft Shredded Cheese. Omit buns. Serve meat mixture over hot cooked basmati rice.